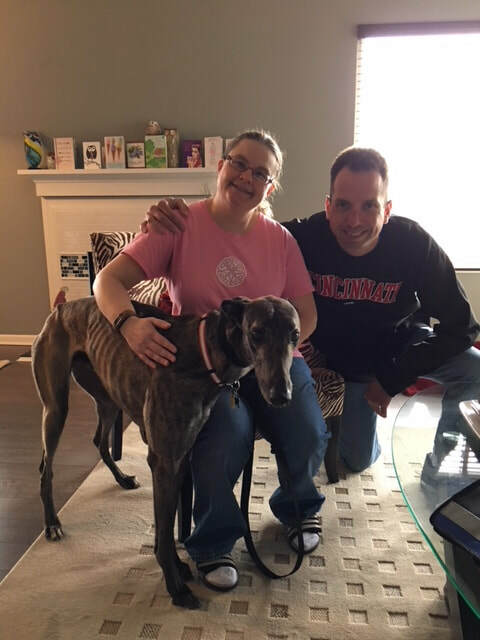 Fly Bobby Jindal is home now with Amy and Jason in Wilder, Ky. Amy is a professor and her hours are flexible so she'll have lots of time for Bobby, she has always wanted a greyhound, now was a good time for her to adopt. This couple does a lot of hiking which Bobby will enjoy! Bobby managed to get up her steps to get to her condo, he had no issues going back down them, thankfully they are carpeted and he is a very smart boy and will learn quickly. Bobby will get lots of attention which he deserves and we hope to see this family in the future.